(Deborah Wall) Keepers of the Wild Nature Park in Valentine, Arizona, has more than 30 large cats, including these two Bengal tigers. 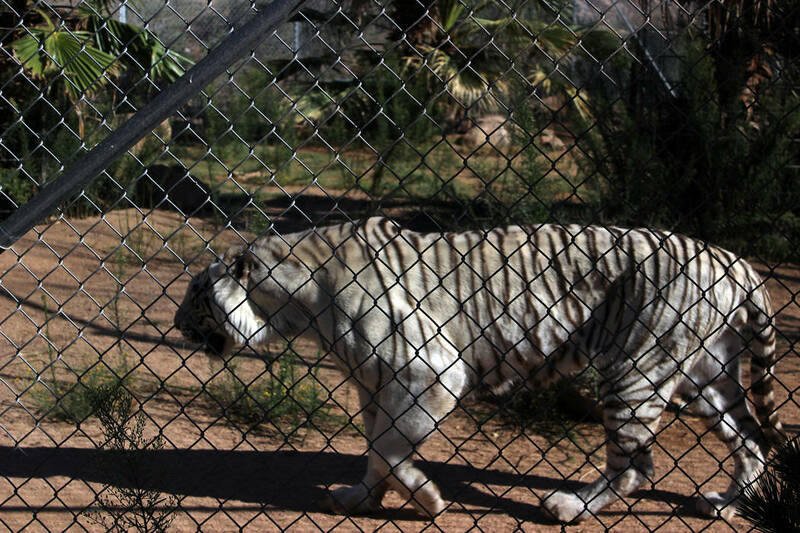 (Deborah Wall) A rare Royal White Bengal tiger is among the more than 150 animals that live at Keepers of the Wild nature park in Valentine, Arizona. 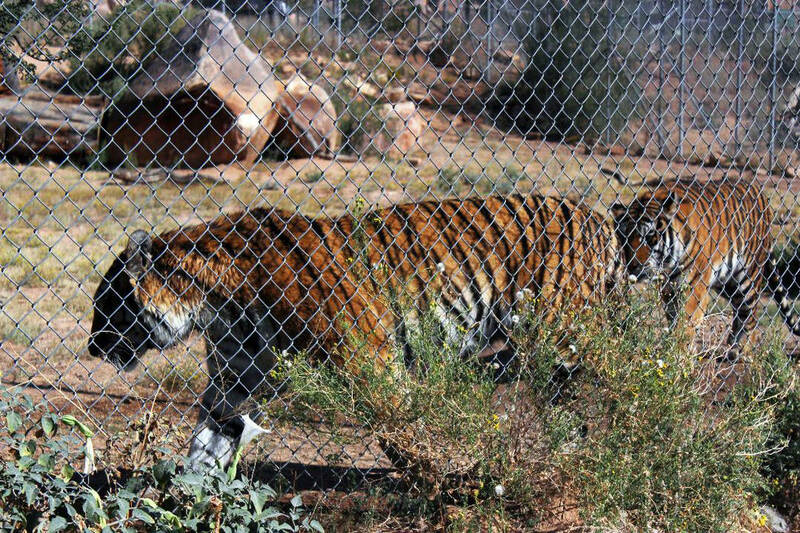 (Deborah Wall) Keepers of the Wild in Valentine, Arizona, provides refuge to more than 150 animals including tigers, lions, bears and primates. It is open daily except on Tuesdays for tours. Jonathon Kraft established the park in Las Vegas in 1995. Needing more room, the operation was moved to White Hills, Arizona, and later to its current location in Valentine, Arizona. The 175-acre refuge is home to about 150 wild animals, including lizards, primates, bears and large cats. At the moment it has more than 30 large cats such as lions, Bengal tigers — including a rare Royal White Bengal tiger — leopards and cougars. All the animals that come here have troubled stories. One rescue, in May, consisted of five black bears that had spent their lives performing and posing for photographs, mostly confined in chains and living in small spaces. In October, Keepers rescued a lion, a tiger and a leopard that had all been kept in their owner’s backyard for 10 years. They now live in spacious enclosures with room to roam and play. You can grab a map of the refuge at its gift shop and take a self-guided walking tour at your leisure, or sign up for a guided safari tour that lasts about one hour and 15 minutes. Tours are available daily at 10 a.m., 1 p.m. and 3:30 p.m., except Tuesdays, when the park is closed. The advantage of the guided tour is that the guides are interesting. Their talking points include why humans need to co-exist with wild animals rather than capture them as pets or exploit them in the entertainment industry or circuses. Wear comfortable walking shoes and bring a picnic lunch. The park is at about 3,800 feet elevation, so it could be about 10 degrees cooler than the Boulder City area. Donations of volunteer time and supplies are always needed. The park has a wish list on its website of its most-needed items. A wide variety of things are welcome, including trash bags, pet carriers, gardening tools, construction supplies and even golf carts. For large items, be sure to contact the park first. General admission fees are $20 for adults, $15 for seniors and the military, and $12 for ages 3-12. Guided safari tours are an additional $10. All proceeds from the tickets, tours and gift shop go to the food, shelter and medical care of the animals. The refuge is open from 9 a.m. to 5 p.m. daily except Tuesdays and on Thanksgiving and Christmas. 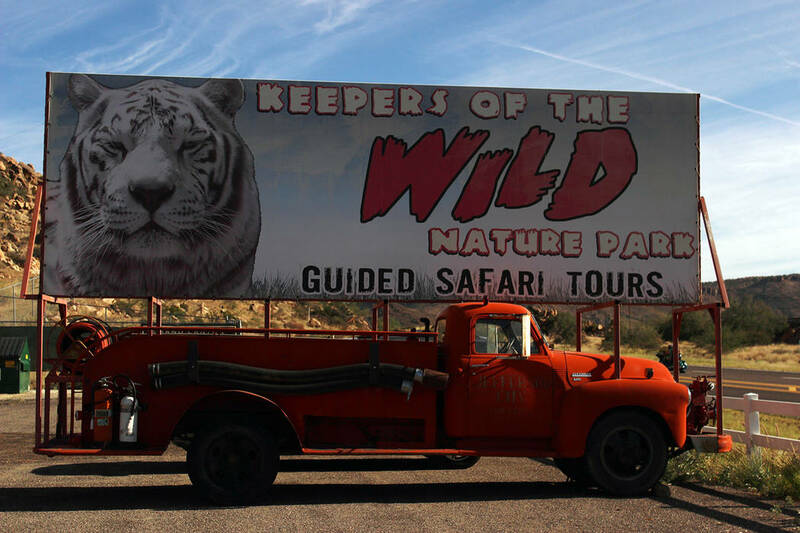 For more information, contact Keepers of the Wild, 13441 E. Highway 66, Valentine, Arizona, www.keepersofthewild.org, 928-769-1800. From Boulder City take U.S. Highway 93 south about 70 miles to Kingman, Arizona. Turn left and merge onto Interstate 40 east for a couple of miles to the Andy Devine Exit 53. Turn left onto Route 66/Andy Devine and travel about 30 miles to Keepers of the Wild, which is on the left.